Please NOTE this page contains affiliate links that will earn me a small commission if you make a purchase, HOWEVER there will be no additional cost to you. Think of it as a small TIP that will enable me to cover the costs to maintain my Blog :- ) Thank You - Dave - the "Cancer Buddy"
The leading providers of 100's of online Yoga classes, guidance and general tips on how to initiate the bodies amazing ability to heal itself, given by world-class experienced instructors using video's and other amazing teaching techniques. New to Yoga ? Why not start off with these amazing free trial programs to get a great introduction of how Yoga can benefit you. Our online classes offer the most convenient way to unleash your best self! Click on the image to join our community of over 200,000 members! Forget yoga DVDs! Gain access to an ever-growing library of 1000+ online yoga classes you can do at home or on the go. YogaDownload features world class instructors teaching classes from super relaxing to more vigorous, in a wide variety of lengths and levels. Our easy-to-use advanced filtering options ensure that you'll find the perfect class every time. We know that starting or maintaining a yoga practice can be challenging from both a time and energy standpoint. The versatility of YogaDownload is perfect for your busy schedule and makes it easy to get your yoga practice in, even on those days when you only have 20 minutes to spare! All for as little as $12 a month or click on the image to try for $1. This is a challenging 3-week weight loss program that is designed to get results. By doing vigorous yoga classes five days a week for three weeks straight, you WILL see a difference in your physique and will lose weight. This program includes 15 yoga classes that are designed to burn calories, get your heart rate up, and produce visible results. Two of the classes offer four different length options so you can choose the option that works best for you and have back-up shorter classes available in the event you are unable to do the assigned full length class one of the days. These classes are vigorous and will build strength and definition in every muscle group in your body. Several of the classes incorporate weights to really challenge your body, melt away fat, and shed pounds. The program also includes a recipe guide with 21 healthy and easy recipes for you to incorporate into your 21-day Weight Loss Program, brought to you by our friends at The Conscious Cleanse. *Please note that this is a challenging program and is best suited for intermediate to advanced students who are looking to lose 10-30 lbs. Led by Claire Petretti, a breast cancer survivor, this yoga class is specifically designed for anyone going through cancer treatment or recovery. 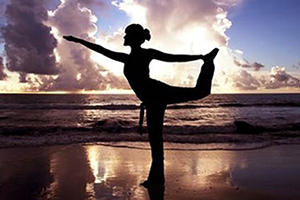 Claire credits yoga for keeping her as mentally and physically fit as possible while she went through treatment. Created to meet a wide spectrum of yoga experience, this program provides a 60 minute practice that is designed to help restore bone loss and muscular strength, all while enhancing circulation, digestion and lymphatic flow. Also included is a 30 minute relaxation practice to help eliminate stress, alleviate pain and soothe your spirit. Choose one or both, depending on your needs and ability!